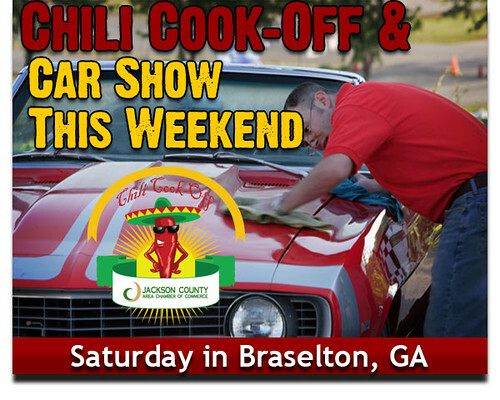 The Jackson County Chamber Chili Cook off in is being held in conjunction with Year One’s Braselton BASH Car Show and Public Safety Day. Teams compete by cooking chili onsight and have the chance to receive the title of "Best Tasting Chili" in Jackson County. Teams also compete to receive the "People's Choice Award", "DeeJay Award" and "Showmanship Award" This event is for the whole family!! So come on out to the Chamber Chili Cook off on April 17th at Year One in Braselton. As always, we’ll have family activities and vendor displays for everyone to enjoy, along with some of the coolest rides in the southeast. Best of all the proceeds from the Braselton Bash benefit the Hot Rodders Children’s Charity, which supports multiple worthwhile causes around the world. See you this Saturday at the Braselton Bash! Only $5 to enter a vehicle in the show! Check out the video from our last show!